FKT is a moniker used in the running and hiking communities. It stands for "Fastest Known Time" - of a given route or feat. In other words, "record." FKTs frequently take place in remote settings and are distinguished from other types of records by their grassroots nature. They are based somewhat on the honor system, though an unofficial FKT website asks for evidence supporting the time before allowing it to reign. Examples of popular FKT routes include rim-to-rim-to-rim at the Grand Canyon, the John Muir Trail, the Appalachian Trail, and summiting Denali. Race you to the other side of the ditch (and back). This is all part of a trend towards "Done in a day" that reflects consumers' continued interest in outdoor adventures, but they prefer to be in their own bed or another comfortable spot (hotel or lodge) at night. 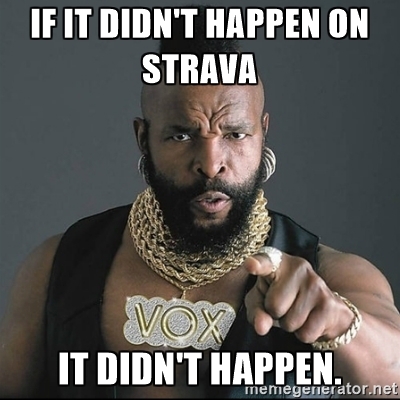 Another correlation is the creation and immense popularity of Strava. Strava is a breeding ground for FKT seekers. Strava is a mobile app that allows one to track workouts using GPS data. Now that anyone can track their speed on any given track on any given day and share that with the world in real time, running a unique route is essentially owning its FKT. 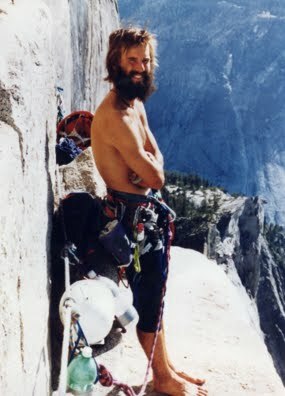 FKTs: beautiful athleticism or narcissistic hubris? Why do people want to run fast? Why do they want to run faster than others? I suppose that is the fundamental question of sport; is it not? Why do we compete in essentially meaningless tests of strength, skill, and stamina? Accolades? Prestige? Our grand ego? Records for records' sake seem silly, particularly in the world of FKTs. Nobody but you cares if you hold the world's fastest ascent of "Varsity Hill" in your local park. Maybe your local buddies do - awesome; Strava on, bro! The community generally gives heed to only the most iconic and aesthetically pleasing routes. Even so, apart from Scott Jurek, and, to a lesser extent, Heather "Anish" Anderson, nobody in the greater public has ever heard a hoot about our little niche world, so doing it for the back pats and ego strokes would be a zero-sum game. A sense of achievement? To train and learn valuable lessons that transfer over to other parts of our lives? An FKT is a starting point for pushing one's physical and mental limits. Without a goal to head toward, we might not push ourselves as far, might not reach the kind of transcendent experience that is the result of a truly hard experience. (I riffed on this in a previous post.) While organized races can provide a medium for hard efforts, there is something unique about FKTs that take you far from the pulse of civilization and require a high level of self-sufficiency. Even folks who are supported in their record attempts take on a slug of logistical planning and coordination that can heighten one's sense of accomplishment and empowerment, and boost one's anticipation happiness. 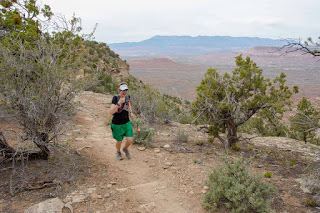 Plus, there's the added benefit that many FKT routes take willing participants to beautiful wildernesses where no organized event could dream of taking place, whether due to remoteness, local regulations, or risk liability. So, why not just go out for a long, beautiful adventure and push yourself hard while doing it? Why do the same arbitrary route someone else has done? I think there is something else caught up in an FKT: wonder. Grassroots records like these spark the same sort of evocative curiosity a child feels when they look at a particularly inviting tree to climb. I wonder if I could do that. Just the mere thought of those words gives me a small tingle in my brain. That's the feel of the mind expanding its understanding of the world and one's place in it. That's the spark of novelty working on the amygdala, leading to future learning and fulfillment. That's a dare that plays on our egos in equal measure to our hopes and joys. As mentioned in my previous post, trail runners are sometimes accused of taking wilderness for granted by speeding through it with nary a glance at the scenery. I understand the sentiment. However, to assume that my motivations for going into wilderness and my experience of wilderness will or should be the same as yours is misguided. Maybe I want to run hard today. I don't want to do it on pavement. I'd love for it to be in a beautiful place. I'd love to breathe clean air while I do it. Don't be offended if I don't decide to stop at every viewpoint or take time to contemplate the profundity of life or delight in the texture of every rock. Maybe that's not what I'm after today. You might think it a "shame" that I'm going so quickly, where as I think it's just dandy that I get to be outdoors today. Some days I go slow, some days I go fast. Some days I muse on life; other days, I think only about what I'm going to eat for dinner. Every day, though, I appreciate those trails exist. I know, too, that it's unsettling to feel like you worked hard to get to a remote mountain pass, step-after-painstaking-step, only to have some neon-short-shorts-wearing goofball come exuberantly bounding through. There's something about being way out there that makes you feel like maybe you're the only person in the universe, that you conquered bravely what others won't, that you are entitled to the rewards of "outstanding opportunities of solitude" (Wilderness Act, 1964). I get that, too. I hope folks can appreciate that it takes no small effort to run through the mountains, either, and that our lightweight gear is not a judgment or taunt, but rather a different mode of adventuring. We earned this, too (and we'll give you your opportunity for solitude back after we finish slurping down this disgusting vanilla Gu, thankyouverymuch). There are a lot of great conversations happening these days about the limitations of traditional western views of wilderness and how to enjoy the great outdoors. Let this post be but a small addition to the rich dialogue regarding staying relevant in the 21st century. Beware those goofballs in neon short-shorts. I want to become the first solo woman to do the [route] not because I want accolades, but because I want to inspire other young women to connect with the natural world on their own terms...Women are the fastest-growing segment of outdoor enthusiasts, but solo female travelers are still few and far between and outdoor participation has actually declined among adolescent girls over the last eight years. I wanted to go after a big FKT because so few women are doing them - not because there are soft records in abundance for the taking (though there are), but because I wanted to highlight that these sort of remote wilderness adventures are for us, too. There is no reason there should be so many missing records for solo women or female FKTs that pale in magnitudes of order to men's. So, where are all those women? What [Anna Frost and Missy Gosney] did [on Nolans 14] was what no woman had managed to do before. Some women had tried, but not a lot in comparison to the number of men that had tried. I don’t know… I’d have to research to see if the number of women represents the number of women who do alpine sports or endurance sports. I have a hankering that the percentage is even less, the women who have tried Nolan’s that do big mountain sports. Seeing two women just ‘woman handle’ Nolan’s last year was definitely inspiring. Prominent ultrarunner Gina Lucrezi took her own gander at why women have so many fewer FKTs on the books, including fear of the dark and confidence issues, two issues that seem condescending on first glance, but are rooted in a bigger cultural question about how we raise young women (and which I've considered in previous posts). Lucrezi also notes that women are still "catching up" in sports since Title IX - we're growing, but haven't quite descended upon the FKT scene...yet. Perhaps women are just less attracted to FKTs than men. I find it hard to believe, based on a long history of competing in sport with other women, but studies do show that women are, on the whole, less drawn to competition than men. Perhaps men are more drawn to making a name for themselves, while women are more content to have an adventure without needing to compete with others for some arbitrary record. Ultimately, if women don't really care about FKTs, that's totally fine - no reason for me to shove it down their throat. However, if there are barriers to women dreaming and executing their wildest FKT dreams in pursuit of the sublime, let us celebrate the inspiring accomplishments of those that have come before us, dare to inspire in our own FKT attempts, and pave the way for others to do the same. You can find the chronicle of my Matthew Baxter III Award FKT journey in New Zealand here. Bawkwin, Peter. Fastest Known Time, ProBoards, 2017, http://fastestknowntime.proboards.com/. --. “Read This First.” Fastest Known Time, ProBoards, 1 Nov. 2009, http://fastestknowntime.proboards.com/thread/19/read-first. Branch, John. "A Real Adventure: Sorting Out All the F.K.T.s (Fastest Known Times)." New York Times, The New York Times Company, 5 Aug. 2015, https://www.nytimes.com/2015/08/06/sports/a-real-adventure-sorting-out-all-the-fkts-fastest-known-times.html. Ellison-Brown, Jennifer. “The Nature and Meaning of Sport.” The Gleaner, The Gleaner Company (Media) Limited, 22 Sept. 2015, http://jamaica-gleaner.com/article/sports/20150922/nature-and-meaning-sport. Fox, Kit. “Scott Jurek Breaks Appalachian Trail Thru-Hike Record: The Ultramarathoner Completed the Supported Trek in 46 Days, 8 Hours, and 7 Minutes.” Runner's World, Rodale Inc., 12 July 2015, http://www.runnersworld.com/trail-racing/scott-jurek-breaks-appalachian-trail-thru-hike-record. Hicks, Meghan. "Carrying Joy: Meghan Hicks's Nolan's 14 Report." iRunFar, iRunFar, LLC, 4 Oct. 2016, http://www.irunfar.com/2016/10/carrying-joy-meghan-hickss-nolans-14-report.html. Hillman, Keith. “Effects of Novelty and Danger on the Brain – The Best Type of 'Natural High'.” Psychology24, Psychology24, 14 Dec. 2014, http://www.psychology24.org/effects-of-novelty-and-danger-on-the-brain-the-best-type-of-natural-high/. Ketcham, Christopher. “The Death of Backpacking? : Younger People Don't Seem Interested in This Outdoors Tradition.” High Country News, High Country News, 25 July 2014, https://www.hcn.org/issues/46.12/the-death-of-backpacking. Kiefer, David. “Is 100 Miles the New Marathon?” Runner's World, Rodale Inc., 18 May 2015, http://www.runnersworld.com/racing/is-100-miles-the-new-marathon. Lapides, Kate. “The Rise of Skimo.” Trail Runner, Big Stone Publishing, 23 Jan. 2015, http://www.trailrunnermag.com/destinations/west/1633-the-rise-of-skimo. Lucrezi, Gina. "FKTs: A Female Perspective." iRunFar, iRunFar, LLC, 15 Aug. 2015, http://www.irunfar.com/2015/08/fkts-a-female-perspective.html. Niederle, Muriel and Lise Vesterlund. "Gender and Competition." The Annual Review of Economics, 2011, 3:601–30, http://web.stanford.edu/~niederle/NV.AnnualReview.Print.pdf. "Outdoor Participation Report 2013." The Outdoor Foundation. http://www.outdoorfoundation.org/pdf/ResearchParticipation2013.pdf. Parker-Pope, Tara. "How Vacations Affect Your Happiness." The New York Times. The New York Times Company, 18 Feb. 2010. http://well.blogs.nytimes.com/2010/02/18/how-vacations-affect-your-happiness/. Powell, Bryon. "Meghan Hicks 2016 Nolan's 14 FKT Interview." iRunFar. iRunFar, LLC, 13 Sept 2016. http://www.irunfar.com/2016/09/meghan-hicks-2016-nolans-14-fkt-interview.html. Roy, Adam. “Anish Breaks Appalachian Trail Unsupported Speed Record: Finishes Hike in Less than 55 Days.” Backpacker, Cruz Bay Publishing, Inc., 2015, http://www.backpacker.com/news-and-events/news/anish-breaks-appalachian-trail-unsupported-speed-record/. "Women in the Outdoors in 2012." Southwick Associates. Southwick Associates, Inc., 2 Oct. 2013. http://www.southwickassociates.com/portfolio/women-in-the-outdoors-in-2012/. “Strava.” Wikipedia, Wikimedia Foundation, 30 Aug. 2016, https://en.wikipedia.org/wiki/strava. "What is Wilderness?" Wilderness.net. http://www.wilderness.net/NWPS/WhatIsWilderness. Thanks Katie! Wondering if you have seen/what you thought of Finding Traction, the documentary about Nikki Kimball on the Long Trail? While I don't personally feel attracted to FKT challenges, she has a quote in there that resonated with me, that (paraphrased) when you are running a race, all you have to do is beat the other people running that day. But when trying to set a trail record, you are racing against anyone who ever has or ever will run that same course.